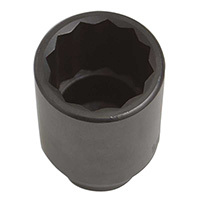 Get the one inch drive deep impact sockets you need to work on a variety of vehicles at Euro Car Parts. Designed for impact wrenches, these products make it simple to tighten and loosen nuts as needed. Specialised tools are the mechanic’s best friend – and you’ll find a range of one inch deep drive impact sockets for your impact wrench right here. 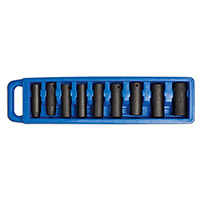 Ideal for taking the stress out of changing wheels, these sockets are designed to fit a variety of nut sizes and types. Impact sockets are attachments for impact wrenches that turn them into versatile tools. While your wrench may have come with a socket set, you might come across nuts that don’t fit the ones you have from time to time. Don’t worry – we sell one inch drive deep impact sockets and many other types besides. Finding the right tools for the job can be a hassle, so if there’s any special equipment you can’t track down, feel free to get our Special Orders team on the case. What’s more, anything you order from our site can be delivered absolutely free within the UK – or just click and collect in store.